Tricky to grow in our climate, most non-organic cucumbers are grown hydroponically (in liquid nutrient solutions), never seeing any soil. Think cucumber’s watery and bland? We really think you can taste the difference when they’re grown naturally in the soil. Our minis (a Delicious Magazine Award winner 2017) are clean and crisp with a sweet bite. Think beyond just slicing cucumber with tomato and lettuce! Try marinating for 30 mins with salt, sugar and a little vinegar and pairing with Asian dishes. Or dice it small, along with radishes, spring onions and chives, in a creamy dressing. Also good paired with its cousins, melon or watermelon, crumbled feta and mint. Cucumber is also a friend to boozy drinks. Infuse in vodka for a refreshing martini: just peel, chop, pour over vodka and leave to infuse for a few days. Keep cucumbers in the salad drawer of the fridge. A plastic bag will help them retain their moisture. They’ll last a week or so, but are best eaten as soon as possible. Delivered from our farm, so please wash before eating. The first fruits generally appear in mid-June, and plants keep producing until late September or October. Cucumbers are difficult to grow in our climate, but in the polytunnels they grow incredible fast and can be hugely productive over our short growing season. 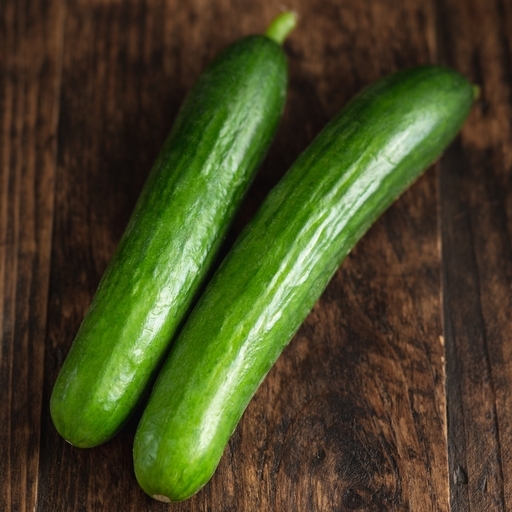 We tend to grow these mini cucumbers, which are at their best when they are about 20cm long.